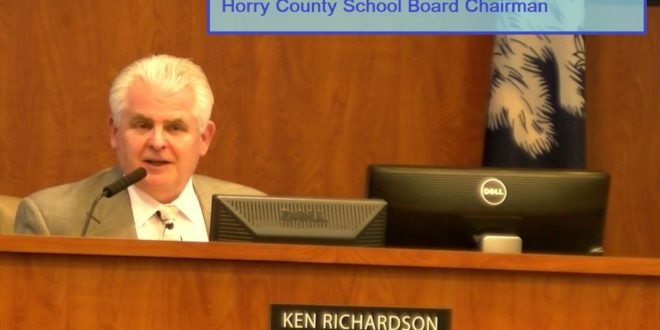 Tonight, Ken Richardson, possibly the most qualified person in the history of Horry County Schools was sworn in as Horry County School Board Chairman. Loved throughout the county, Ken Richardson garnered 82,000 votes last November in the general election. The HCS facility was packed. Local officials including Horry County Treasurer Angie Jones, Horry County Councilman Al Allen and Horry County Council Chairman Johnny Gardner were among those present to witness the swearing in. Richardson Gallery Bio at Horry Georgetown Technical College: The Richardson Gallery of Horry-Georgetown Technical College, Conway Campus, was established by and is supported through the generosity of Ken and Donna Richardson. Mr. Richardson is the past Chair of the Horry-Georgetown Technical College Area Commission. The Richardson Gallery provides the College with an elegant, artistic environment on the Conway campus in which to hold celebratory events, host meetings for special guests, and serve as a pre-session setting for meetings and conferences. Horry County Schools’ vision is to be a premier, world-class school system in which every student acquires an excellent education. Our schools will be welcoming centers organized around high-quality teaching and learning.